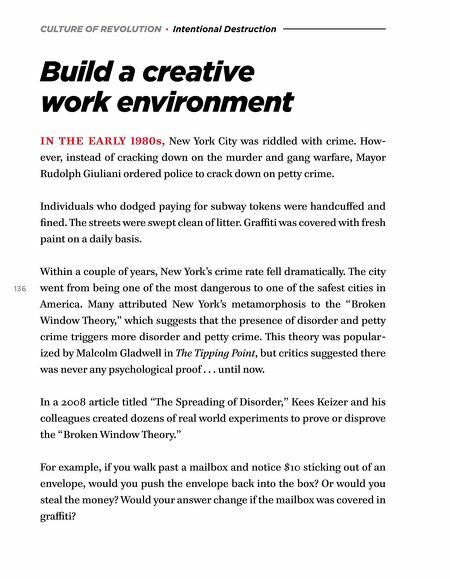 CULTURE OF REVOLUTION · Intentional Destruction Build a creative work environment IN THE EARLY 1980s, New York City was riddled with crime. How- ever, instead of cracking down on the murder and gang warfare, Mayor Rudolph Giuliani ordered police to crack down on petty crime. Individuals who dodged paying for subway tokens were handcuffed and fined. The streets were swept clean of litter. 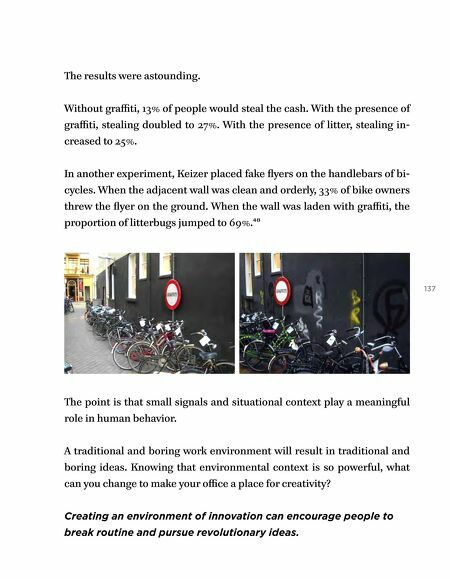 Graffiti was covered with fresh paint on a daily basis. 136 Within a couple of years, New York's crime rate fell dramatically. The city went from being one of the most dangerous to one of the safest cities in America. Many attributed New York's metamorphosis to the "Broken Window Theory," which suggests that the presence of disorder and petty crime triggers more disorder and petty crime. This theory was popular- ized by Malcolm Gladwell in The Tipping Point, but critics suggested there was never any psychological proof . . . until now. In a 2008 article titled "The Spreading of Disorder," Kees Keizer and his colleagues created dozens of real world experiments to prove or disprove the "Broken Window Theory." For example, if you walk past a mailbox and notice $10 sticking out of an envelope, would you push the envelope back into the box? Or would you steal the money? Would your answer change if the mailbox was covered in graffiti?